While in Oaxaca I was fortunate enough to tag along with a friend to a workshop at Tlapanochestli, a small farm cultivating La Grana Cochinilla and other crops for use as natural dye products. 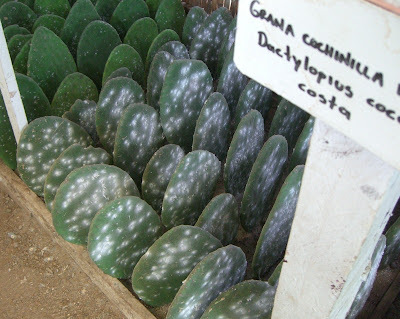 Cochineal (cochinilla in Spanish) is a parasite that grows on prickly pear cactus paddles. It has been used to produce a vibrant red tint since pre-hispanic times. Tlapanochestli offers a multitude of workshop topics. 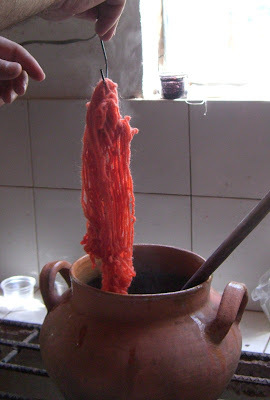 Ours focused on learning how to use La Grana Cochinilla to create various dyes for wool and cotton yarns. 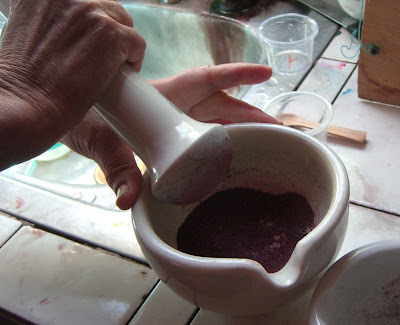 First we weighed the cochineal, then ground it to a fine powder. The powder was mixed into hot water and carefully measured quantities of acids or bases were added to adjust the PH. 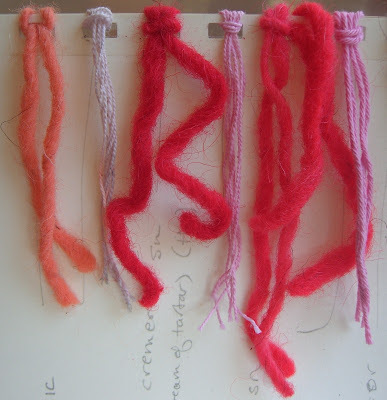 After soaking the yarns in the dye for about an hour, they took on beautiful shades of red. Changing the PH had the affect of moving the tint's color from bright red to either an orange or violet direction. Mixing it with other natural plant based colorants, such as indigo and muicle gave us an even greater range of hues. 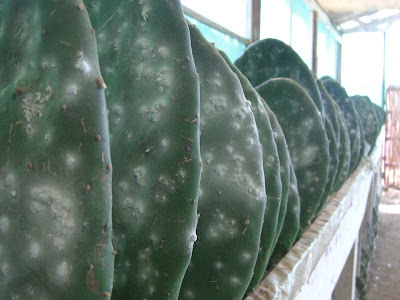 The bugs have a long history of being grown and harvested in Oaxaca and much of the region's current prominence and strong infrastructure can be attributed to the production and trade of cochineal during the days of the Spanish conquistadors. 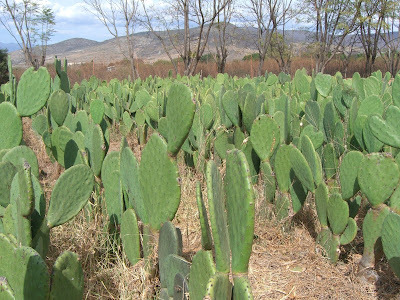 With the advent of cheap, synthetic dyes however, the difficult business of cochineal farming has been nearly abandoned (imagine having to build greenhouses and shaded areas for bug infested *cactus*). 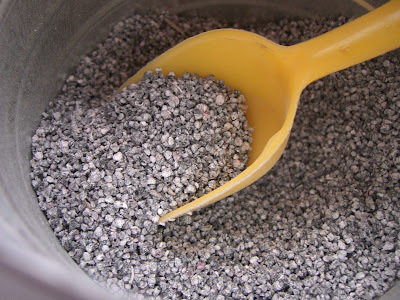 Today however, interest in the product is resurfacing since the natural colorant is safe (non-carcinogenic) and can be used in a number of applications from textiles to foods, beverages, cosmetics and more. All in all, I enjoyed a beautiful day out at the cochineal farm. 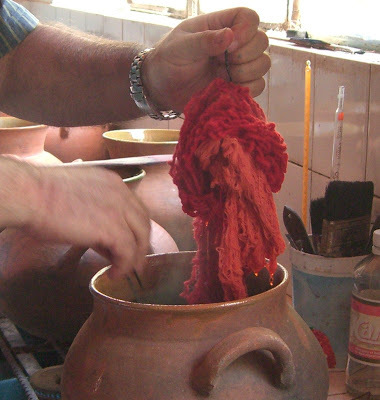 I am a resident of Cuernavaca, Morelos and currently representing an American Company interested in the Cochineal for use in a beverage. I would appreciate any information on where or whom to contact and send and seek further information. Thank you for your courtesy in this matter.